When Rebecca from Square Meal Round Table invited me to collaborate on their 4th ingredient collaboration, carrots, I was totally on board and knew that I wanted to take the delicious sweet carrot and pack a bit of punch to it. I’m joined by many talented bloggers for this fun event. You can find a list of them below in recipe notes, you can also follow our hashtag on Instagram #24carrotgoals for so much inspiration! One of my favorite things is taking day to day ingredients and infusing them with the flavor and spices of my culture and heritage. A largely popular spice in Lebanese cuisine is sumac, the sumac bush produces vibrant red berries which are then dried and ground into a coarse powder. The sumac spice has a lemony, salty and slightly acidic flavor profile. It really packs a punch and also creates complex flavor. The best part of sumac is the vibrant pop of color it can give food with its bright maroon/red color. Sumac is most commonly used in salads, za’atar and to top various dips (hummus, baba ganoush, labneh) but don’t let it fool you, it can be used for most any dish from chicken to beef to potatoes. It is best used to top food with AFTER it has been cooked to really make the flavor pop. 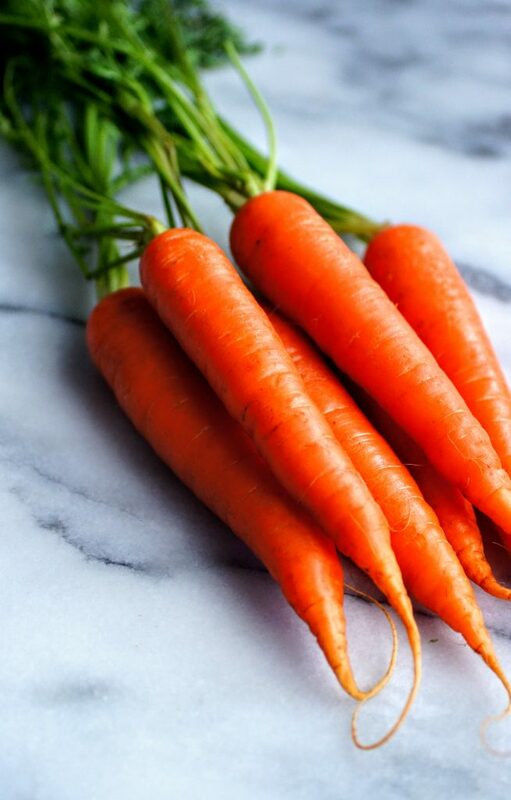 Carrots have to be one of the most loved root vegetables. Sweet, crisp, delicious raw or cooked, gorgeous color, they are perfect. I wanted to let carrots shine in a very simple side dish. 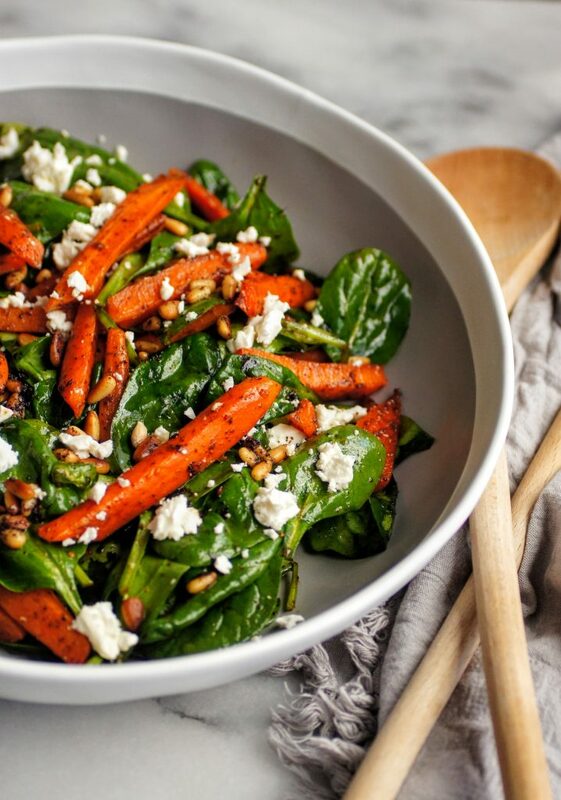 Roasted carrots + spinach + feta and the all loving sumac come together to create a fresh and vibrant new side dish that is vegetarian, gluten free and most importantly, delicious. Easily eaten as is or topped with grilled chicken or steak to make a complete meal. This dish takes no longer than 20 minutes to prepare but will impress at any dinner party or on your table this evening. Enjoy and be sure to check out the other amazing bloggers for more carrot-spiration! As always, I love seeing your creations, tag me on Instagram @CosettesKitchen or post on my Facebook Page. 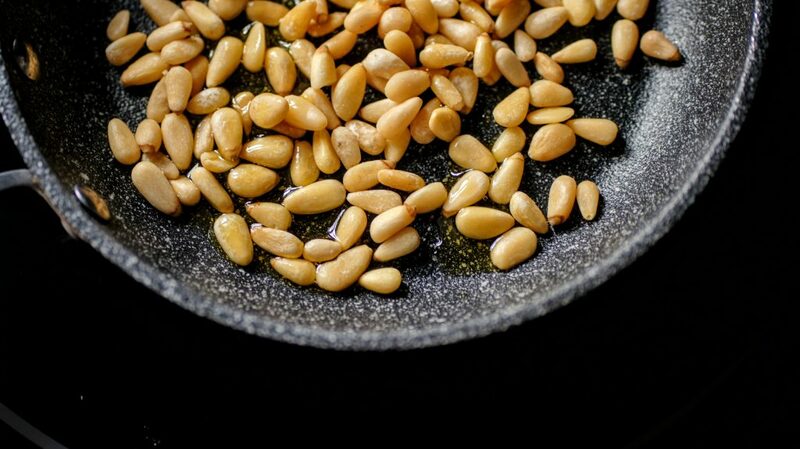 Toasted pine nuts to top the warm salad. Clean, peel and cut carrots into long slender slices. I typically half the carrot then cut each half diagonally 1-2 times. 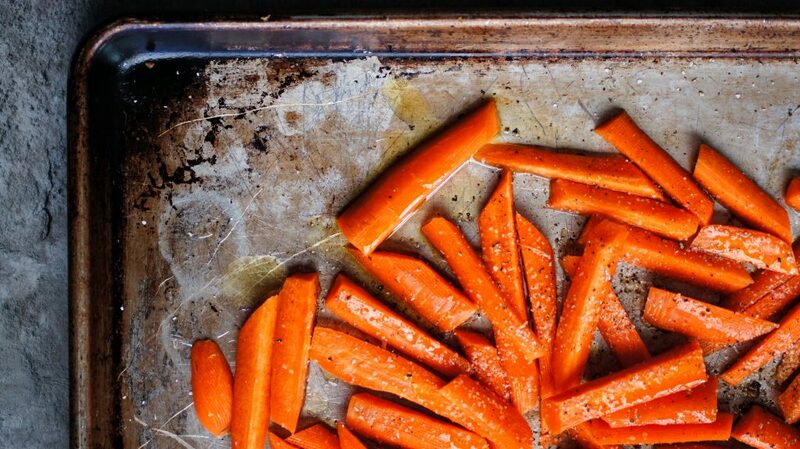 Place sliced carrots on a sheet pan and drizzle with olive oil, salt and pepper. Toss to coat evenly. Roast carrots in pre-heated oven for about 15 minutes. You want carrots to be roasted but yet still firm. 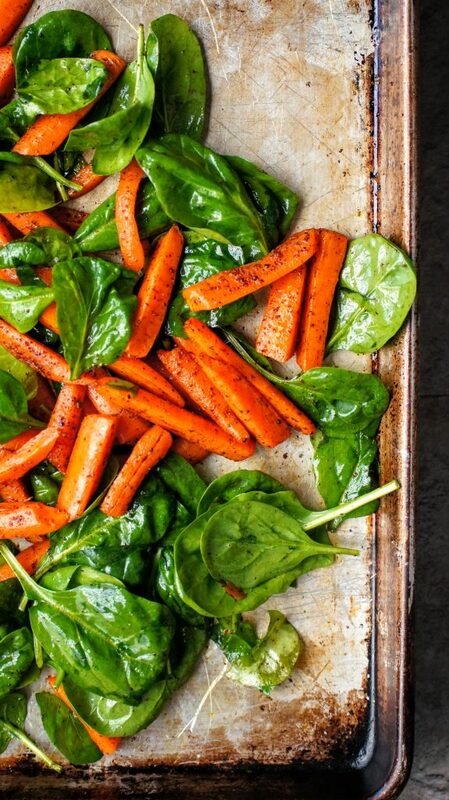 Remove hot tray from oven and immediately toss in spinach and sumac with carrots. Toss over and over until the spinach is coated and slightly wilted. Taste and add any additional sumac, salt or pepper to taste. In a small pan, place a tsp of olive oil in a pan with the pine nuts. Roast on medium heat for about 5 minutes. Be sure to shake pan to ensure the nuts are browned evenly. 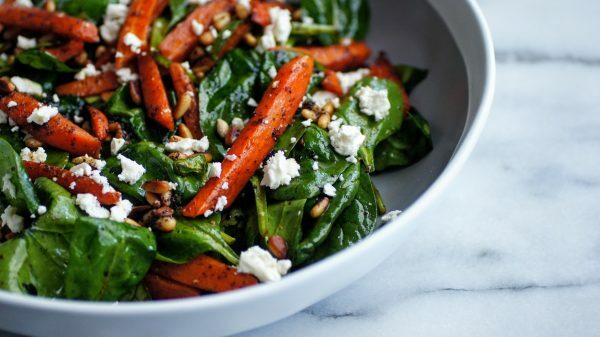 Plate spinach + carrot mixture, top with pine nuts and crumbled feta and a squeeze of lemon. Enjoy! *Sumac can be found at most Middle Eastern grocery stores or in your nature section of your grocery store. *Top the salad with chicken or steak to complete your meal. This looks amazing, and like something I can handle! Ha! Yes!! So glad sissy!